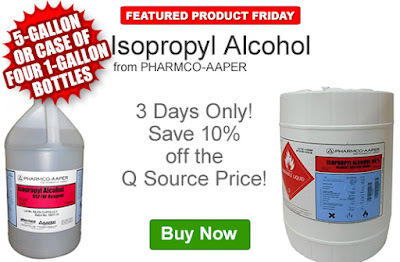 Save an extra 10% off the Q Source price of the PHARMCO-AAPER Isopropyl Alcohol. Our FPF010617 Coupon Code is auto applied when you add an eligible isopropyl alcohol product to your shopping cart. This Featured Product Friday (FPF) promo is valid from today, January 6, 2017 through Sunday, January 8, 2017 and the code is unlimited use. Our Featured Product Friday exclusive savings apply to the 5-gallon or case of four 1-gallon bottles of this IPA. MSDS and technical data sheets for each eligible PHARMCO-AAPER Isopropyl Alcohol item are available on our individual product pages at QSource.com. Click here to shop, or for further questions about Featured Product Friday, please read our informational blog post, call us (800-966-6020), or send us an email. Please note: This promo is valid only at QSource.com and expires on January 8, 2017.